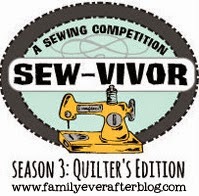 snips snippets: Finish it up Friday - the Swoon mistake. So yesterday i discovered the downfall of finishing up a project that was started over a year ago. When i started my Washi Swoon quilt i cut all the fabrics i needed for the blocks but neglected to cut the sashing, thinking, (okay probably thinking, because really people it was a year ago, i'm lucky if i can remember last week...) thinking, that i would cut the sashing when i needed it, you know a week or two later. Fast forward, and i have no idea what so ever of which white i used! So i pull out my stash of whites and come to the conclusion that i was using Kona PFD. Perfect! 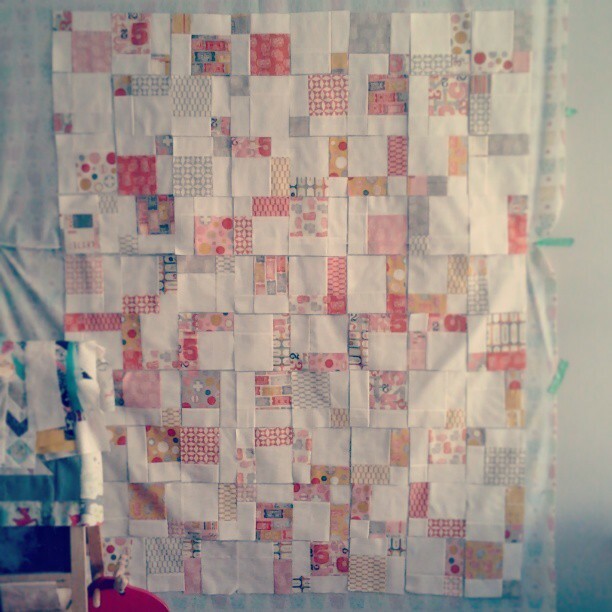 I had just recently picked up another few yards to use on my Indian Summer quilt. So i cut my 6 two and a half inch by twenty four inch strips and stitched the first one on... And it looks like i wasn't using Kona PFD after all, dang! But the bright side is, while it's not the white i had used in the blocks, (still have no idea what it was) it's a perfect match to the white in the Stella Dots i used! So my own personal opinion is that it looks fine and i don't need to take it all apart! Whew! Now, i have yet to add the borders around the outside, mainly because i'm not sure what i want to do, but also because my kidlets have been playing percussion with the pots and pans all day and i have a monster headache, tomorrow is soon enough! But i'm kind of thinking, two and a half inches of white, then two and a half inches of the washi print, another two and a half of white and then the washi as binding, maybe not? Then i started wondering about all the hst's i have left from making the blocks. As i was sewing everything together, instead of just cutting off the excess after making the flying geese i marked off a half inch into what would be waste and stitched, then cut down the middle, yielding the block that i need as well as two hst's that would normally be scraps! And here they are! My modern D9P using two charm packs of 2wenty Thr3e and Kona PFD... (keeping tabs on my whites from this point on!) Hoping to get this one stitched up this weekend! High fives for bed time! Linking up for Finish it up Friday with Amanda Jean! And another over at Kelly's for her Needle and Thread Thursday! Oh how very frustrating trying to match the white! But I have to say I think it worked out well! The sashing definitely matches the dot fabric so that ties in nicely. I'm no help for the border, but think that was a clever idea to make HSTs out of the leftovers. Must keep that in mind for my Fireworks quilt. I am sorry but I was laughing throughout this post. Not laughing at you,of course, but with you because this kind of sounds like a play out of my play book!! But surrendipitiously your unmatched whites have matched up Ina balanced way!!! I am a simple girl so I like your idea of the white then washi then white then washi binding. I think you definitely need to use them though in some way on the back. I love! Your D9P! Have a great weekend! I agree, it looks like it could be a purposeful choice and you do not have to take them out. It's a lovely top! Looks great! I love the idea of the HSTs in the border echoing the rhombus shape on the outside points of the swoon stars. Oh, I love your projects! I find the "buying-white-thing" very difficult too! I have found a local shop where they have a great regular cotton in a pretty white. Can't wait to see all the finishes! Your Swoon top is amazing! I love that you did the white Stella dot, it makes the Washi prints "burst"! 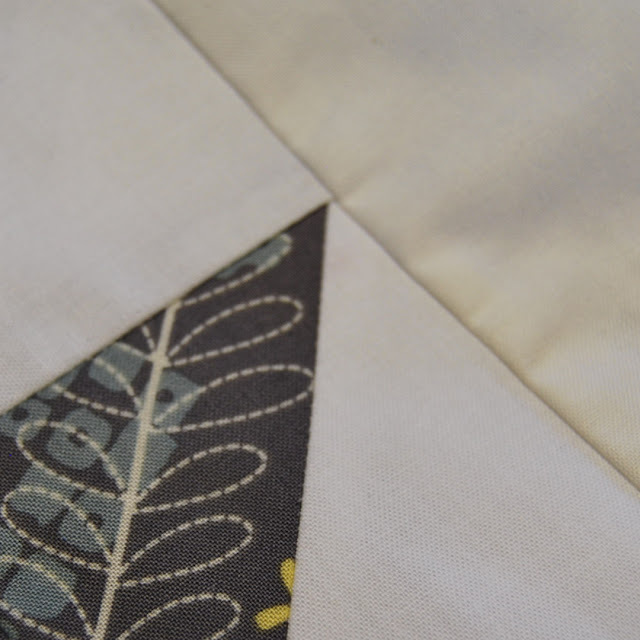 Personally, I have solved the Kona white problem by flatly refusing to put solid white in my quilts anymore, forever. lol. I'm not that serious (I did one recently with Bone) but a big part of not choosing white anymore is trying to decide whether random cuts in the pile are Bone or Snow. I'm stumped about your HST leftovers! Sleep on it. I think fabric talks to me in my sleep. Waste not, want not. Use those suckers! Oh my gosh how frustrating that must have been! Your swoon looks positively stunning though regardless of the smashing in actually really like your white variations through out the quilt. You are making huge process on your WiPs list, I better get back at 'er if I want to keep up! p.s. loving what you're doing with the twenty thr3e charms! I have, unfortunately, had the same sort of white matching problem. 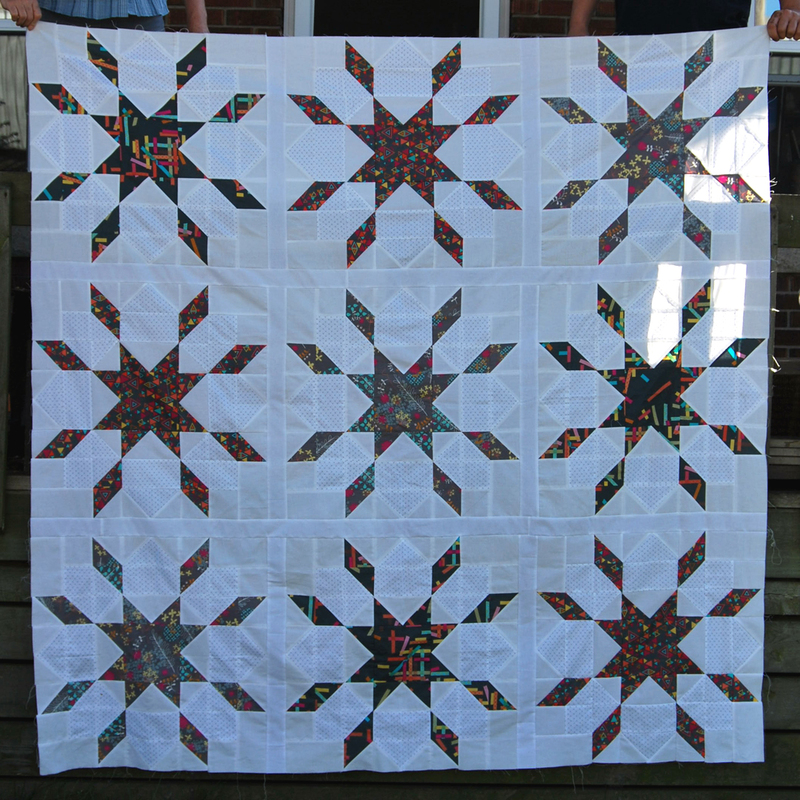 I think the Kona White does look great with the quilt since it matches the Stella Dot. Also, I think a border would look awesome! I think it's a great way to use up all of those little scraps to keep them from going to waste! 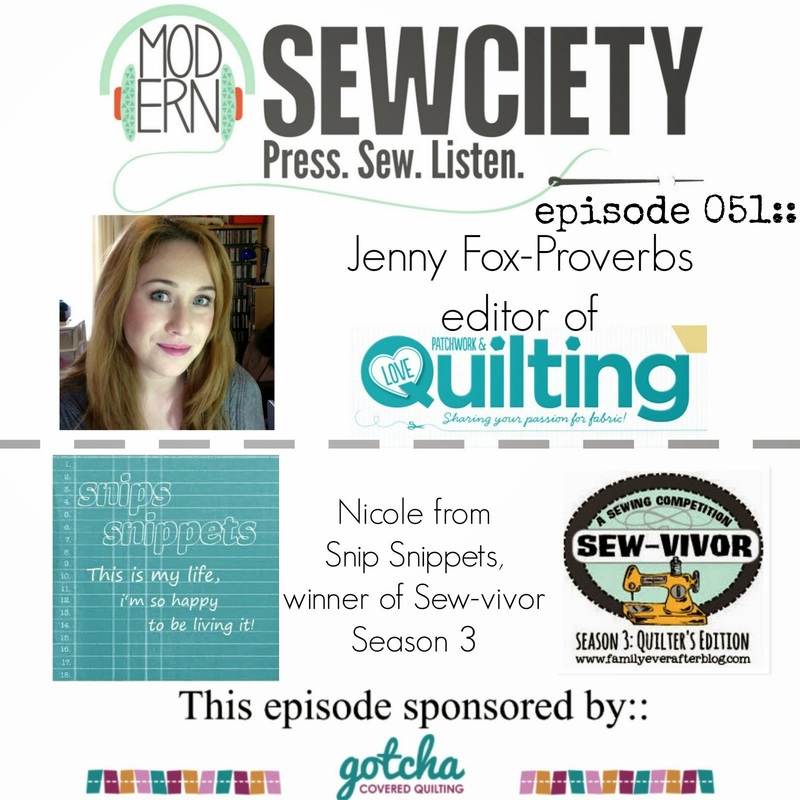 Thanks so much for sharing this at Needle and Thread Thursday! I think you made the right choice! It looks awesome. Your Swoon looks great!! Not sure I would have stuck with it after two wrong whites. Love your nine-patch. It's going to be beautiful! Your quilt top is so bright and cheery. No one is going to know the "tale of two whites" unless you tell them. And I won't tell! I was reading an article in this month's Quiltmaker mag about borders. I liked what the author said about incorporating the design in a part of your block into the border. She had some great pictures. I'm thinking that's what you'll get with the half squares. Very cool that you had the premonition to make the HSTs off of the flying geese and save your quilt today (from yesteryear, before you knew it! ).